When I weary of one project I hop to another. I have sewed on enough buttons for a time and am now laying out my log cabin lap robe. 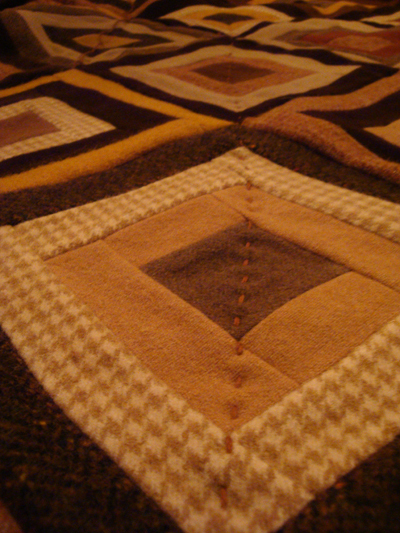 I pieced this classic pattern together using recycled wool I had collected from clothing. 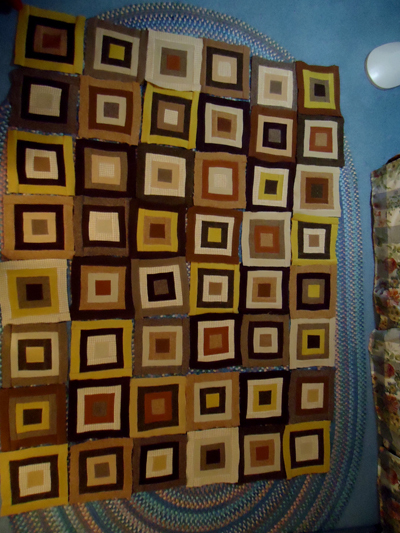 I first lay out the rich, dark brown, wool backing on the floor and add the quilt top. 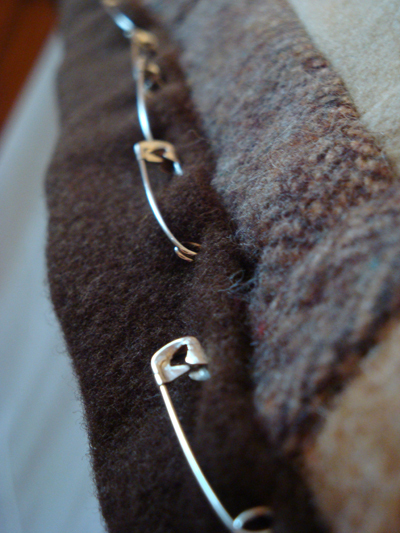 Once I have centered the top on the backing, I pin it together from the middle out, pinning the edges last. Traditional Sashiko quilting is usually done with a special long and large-eyed quilting needle with a coarse decorative thread. This type of quilting not only attaches the quilt back to the front and through a batting, but it makes a bold design statement that sometimes regular quilting doesn’t make. I have chosen the heavy thread and big stitches as my felted wool is coarse and heavy and I want to emphasize its primitive style. I wonder how to bury my thread as I do in hand quilting and must pause. Sashiko quilting not only uses a coarse thread but it is stitched with a double threaded needle. 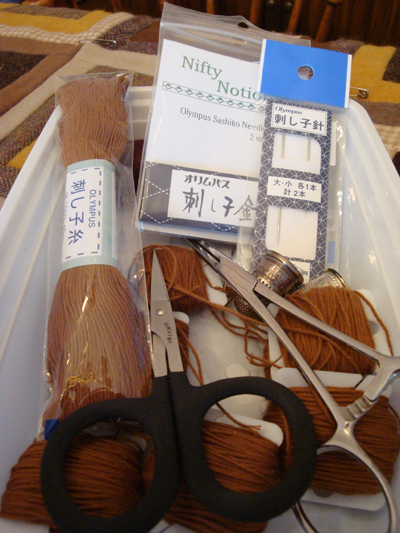 My resources indicate that knots are usually left on the back side of the quilt. 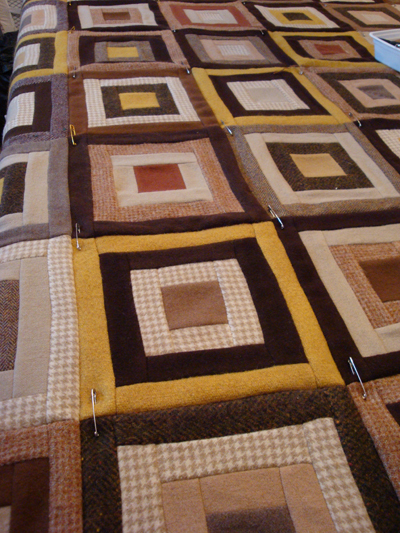 I want to hide my knots as I do in regular hand-quilting. Studying the top of my quilt, I can bury my knot just as I normally would. And it works! 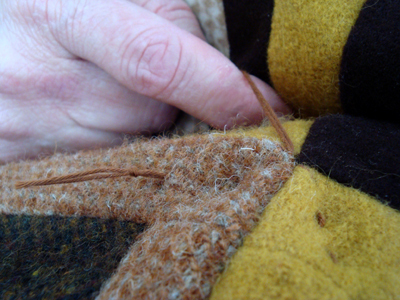 I pull my knot through a looser weave and anchor it right in a corner of the quilt block against a tighter woven wool. I decide to start my running stitch going diagonally, corner to corner in each square, starting in the middle just as I would if I were basting a quilt back to its front and smoothing out any wrinkles along the way.